Any solid material undergoes some elastic deformation if we apply a small external force on it. It is very important to know the extent of this deformation. Whenever, engineers design bridges or buildings and structural implants for body, it is useful to know the limits of elastic deformation for endurance. Young’s modulus is a measure of the stiffness of a solid material. It is calculated only for small amounts of elongation or compression which are reversible and do not cause permanent deformation when the external applied force is removed. For this reason, it is also called elastic modulus. A stiff material has a high Young’s modulus and changes its shape only slightly under elastic loads. A flexible material has a low Young’s modulus and changes its shape considerably e.g. Young’s modulus of steel is much more than rubber. So contrary to our perception, steel is considered more elastic than rubber. Young’s modulus is a characteristic property of the material and is independent of the its dimensions i.e., its length, diameter etc. However, its value depends on ambient temperature and pressure. The units of Young’s modulus are the same as that of stress (note that strain is dimensionless) which is same as the units of pressure i.e., Pa or N∕m2. 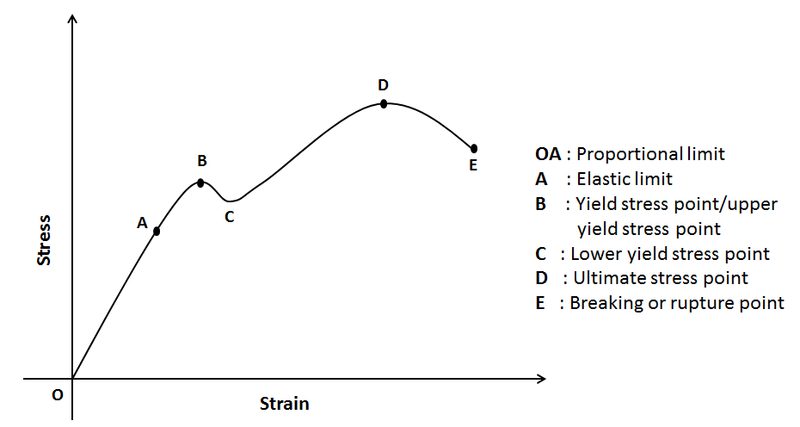 Graphically, Young’s modulus is generally determined from the slope of stress-strain curve. Normally, we use Searle’s method to measure the Young’s modulus of a material. As Young’s modulus is independent of the shape of the material, we can utilize any shape for its calculation. In particular, a thin circular wire fulfills our requirement. In this method, the length L of the wire is measured by a scale, diameter d of the wire is measured by a screw gauge, length l of the wire is measured by a Micrometer or Vernier scale, and F is specified external force. where ΔL, Δd, and Δl are the errors in the measurement of L, d, and l, respectively. Generally, accuracy of these errors measurements depends on the least count of the measuring instrument. Searle’s method is quite popular in IIT JEE because it tests you on (1) measurement using the screw gauge and the Micrometer/Vernier scale and (2) measurement error analysis. Let us solve some IIT-JEE problems which are based on it. due to the error in the measurements of d and l are the same. due to the error in the measurement of d is twice that due to the error in the measurement of l.
due to the error in the measurement of l is twice that due to the error in the measurement of d.
due to the error in the measurement of d is four times that due to the error in measurement of l.
From given data, F = mg = 9.8N, L = 2.0m, l = 0.8 × 10-3m, and d = 0.4 × 10-3m. Substitute the values in equation to get Y = 1.95 × 1011 ≈ 2.0 × 1011N∕m2. Thus, ΔY = 1.09 × 1010N∕m2. It consists of two wires (control or reference wire and test wire) of equal lengths and are attached to a rigid support (see figure). Both control and test wires are connected to a horizontal bar at the other ends. A spirit level is mounted on this horizontal bar. Now, this bar is hinged to the control wire. If we increase the weight on the side of test wire, it gets extended and causes the spirit level to tilt by a small amount. We can adjust any tilt of the spirit level by turning the screw of a micrometer, which is positioned on the test wire side. We restore it to the horizontal position to take the desired readings. In a variation of Searle’s apparatus, the control wire supports a vernier scale which will measure the extension of the test wire. The force on the test wire can be varied using the slotted masses. The micrometer is same as screw gauge. It has a main scale (shown vertically in the figure) and a circular scale (shown horizontally in the figure). When the screw is rotated to make the spirit level horizontal, the readings of the main scale and circular scale change. These readings are used to find the elongation l of the test wire. Measure the initial length L of the wire by using a meter scale. Measure the diameter d of the wire by using a screw gauge. The diameter should be measured at several different points along the wire. Adjust the spirit level so that it is in the horizontal position by turning the micrometer. Record the micrometer reading to use it as the reference reading. Load the test wire with a further weight. The spirit level tilts due to elongation of the test wire. Adjust the micrometer screw to restore the spirit level into the horizontal position. Subtract the first micrometer reading from the second micrometer reading to obtain the extension l of the test wire. Calculate stress and strain from the formulae. Repeat above steps by increasing load on the test wire to obtain more values of stresses and strains. Plot the above values on stress-strain graph; it should be a straight line. Determine the value of the slope Y . The wire may not be uniform or cross-section may not be exactly circular throughout the length of the wire. To avoid consequent error in the measurement of diameter, the screw-gauge reading is to be taken at different places and at mutually perpendicular directions at each place of the wire. Take mean value of these reading to get the average diameter. Plot the calculated values of stress and strain on the stress-strain curve. Estimate the slope of this curve in the linear region to get the Young’s modulus of the material of the wire. Substitute the measured value of L, measured value of d and estimated value of tan θ (from graph) to get Young’s modulus. Will there be any error if the control (or reference) wire and the test wire are not of the same material? If wires are of different material then their thermal expansion (due to temperature change during experiment) will be different. This will introduce an error in the measured elongation l.
The wires used in the experiment are identical, long and thin. The long and thin wires gives larger elongation and hence better measurement accuracy. The wires should be taut otherwise length L can not be measured correctly. The control weight or dead weight is used to make the wires taut. List out various sources of errors and ways to reduce them. When a set of readings are taken, the micrometer screw must be rotated in the same direction to avoid back-lash error. The micrometers (screw gauges) usually have back-lash error. It is the maximum change in micrometer reading to start physical movement of the screw in reverse direction. You can experience this error with a simple nut and bolt. After adding a load or removing a load, wait for some time before taking the next reading; this will help the wire to elongate or contract fully. The stress-strain curve of a material indicates important mechanical properties of the material. The curve for a typical elastic material like metal wire is shown in the figure. Hooke’s law, F = kl, is obeyed in the region of proportionality (region OA in the figure). The slope of the line OA gives Young’s modulus Y . If the strain is increased beyond A, the stress is no longer proportional to the strain. Can you answer why stress-strain curve is preferred over load-elongation curve? Refer your Physics textbook for more explanation on stress-strain curve. Problem 1. What do you understand by the statement “The elastic limit of steel is greater than that of rubber”? Problem 3. The Young’s modulus of a wire of diameter d and length L is Y N∕m2. If the diameter and length are changed to 2d and L∕2, respectively, then its Young’s modulus will be? Problem 4. The ratio of radius of two wires of the same material is 2:1. If the same force is applied to both of them, the extension produced is in the ratio 2:3. What will be the ratio of their lengths? Problem 6. A load of 4.0kg is suspended from a ceiling through a steel wire of length 20m and radius 2.0mm. It is found that the length of the wire increases by 0.031mm as equilibrium is achieved. Find Young’s modulus of steel. Take g = 3.1πm∕s2. Problem 9. One end of a wire 2m long and 0.2cm2 in cross section is fixed in a ceiling and a load of 4.8kg is attached to the free end. Find the extension of the wire. Young’s modulus of steel is 2.0 × 1011N∕m2. Take g = 10m∕s2. Problem 11. Two wires of equal cross section but one made of steel and the other of copper, are joined end to end. When the combination is kept under tension, the elongations in the two wires are found to be equal. Find the ratio of the lengths of the two wires. Young modulus of steel is 2.0 × 1011N∕m2 and that of copper is 1.1 × 1011N∕m2. Problem 12. The ratio stress/strain remains constant for small deformation of a metal wire. When the deformation is made larger, will this ratio increase or decrease? Problem 20. The two wires shown in the figure are made of the same material which has a breaking stress of 8 × 108N∕m2. The area of cross section of the upper wire is 0.006cm2 and that of the lower wire is 0.003cm2. The mass m 1 = 10kg, m2 = 20kg and the hanger is light. (a) Find the maximum load that can be put on the hanger without breaking a wire. Which wire will break first if the load is increased? (b) Repeat the above part if m1 = 10kg, m2 = 36kg. Problem 24. A light rod of length L is suspended from a support horizontally by means of two vertical wires A and B of equal length as shown in figure. The cross-sectional area of A is half that of B and the Young’s modulus of A is twice that of B. A weight W is hung as shown. What is the value of x so that W produces (a) equal stress in wire A and B? (b) equal strain in wires A and B? Problem 25. The elastic limit of a steel cable is 3.0 × 108N∕m2 and the cross-sectional area is 4cm2. Find the maximum upward acceleration that can be given to a 900 kg elevator supported by the cable if the stress is not to exceed one-third of the elastic limit. Problem 26. A 6 kg weight is fastened to the end of a steel wire of un-stretched length 60 cm. It is whirled in a vertical circle and has an angular velocity of 2 revolution per second at the bottom of the circle. The are of cross section of the wire is 0.05cm2. Calculate the elongation of the wire when the weight is at the lowest point of the path. Young’s modulus of the steel is 2 × 1011N∕m2. Problem 27. A bob of mass 10 kg is attached to a wire 0.3 m long. Its breaking stress is 4.8 × 107N∕m2. The are of cross section of the wire is 10-6m2. What is the maximum angular velocity with which it can be rotated in a horizontal circle? Problem 28. A uniform steel (density ρ) rod of cross-sectional area A and length L is suspended so that it hangs vertically. The stress at the middle point of the rod is? Problem 29. From the relation Y = , can we say that if length of a wire is doubled, its Young’s modulus of the elasticity will also become two times? Problem 31. A lift has a capacity to carry 8 passengers each of average mass 75 kg. The lift is supported by two steel ropes, each of length 70 m. Each rope has 100 strands with cross sectional area of each strand as 10-6m2. Calculate by how much an empty lift moves down when it is entered by 8 passengers. The Young’s modulus of the steel is 2 × 1011N∕m2? the maximum change in length before fracture occurs. Problem 33. What are the stress, the strain and hence the approximate Young’s modulus for a fibre of the protein elastin which has a cross-sectional area l.0 × 10-10m2 and which is stretched to twice its original length by a force of 5.0 × 10-5N? There is an alternative experiment to measure Young’s modulus. The experiment is explained in a YouTube Video . This experiment makes use of traveling microscope to measure elongation of the wire. The writeup of this experiment is given in a pdf document available online . An improvement of Searle’s method is suggested by B. Sutar and others . The authors suggested application of single-slit diffraction in Searle’s apparatus to improve measurement accuracy of Young’s modulus. Another experiment to find young’s modulus of a wire. https://youtu.be/U5SOFeZJelY. YouTube Video. A cyberphysics webpage on young’s modulus. https://goo.gl/x8Mu2W. Good detailed article. Pacific physics volume 1. https://goo.gl/1qJQUU. See Page 318 on Google Book. Physics higher secondary first year volume 1 (tamilnadu board textbook). http://www.textbooksonline.tn.nic.in/books/11/std11-phys-em-1.pdf. See page 215 in pdf given at this link. Short video on youtube. https://goo.gl/S2LwDR. By Amrita Vishwavidyalaya University. Short video on youtube. https://goo.gl/Jf3C2e. By Dept of Physics, CVRCE. Webpage giving theory, animation, video etc. https://goo.gl/bKHvtr. Amrita Olabs Webpage. Writeup of another experiment to find young’s modulus of a wire. https://goo.gl/GTRC4B. Writeup in PDF. B. Sutar, K.P. Singh, V. Bhide, D. Zollman, and A. Mody. Application of single-slit diffraction to measure young’s modulus. Lat. Am. J. Phys. Educ., 4(3), 2010. HC Verma. Concepts of Physics. Part 1, 1992. Page 283.